A tweet from Motorola sent out on Wednesday, revealed that the manufacturer has added a 64GB variant of the Motorola Moto X Pure Edition. This is important because the Moto X is offered without a microSD slot that could have expanded the amount of memory on the device. The 64GB model is a Pure Edition exclusive and costs $100 more than the 32GB variant. That makes the price $599.99 for the 64GB version. Don't let the fancy name fool you. The Motorola Moto X Pure Edition is merely the unlocked and unbranded version of the second edition Motorola Moto X. If you need a little reminder, the phone features a 5.2-inch AMOLED screen with a resolution of 1080 x 1920. A quad-core 2.5GHz Snapdragon 801 CPU is under the hood, with the Adreno 330 GPU handling graphics. 2GB of RAM is inside, and the back and front-facing cameras weigh in at 13MP and 2MP respectively. A 2300mAh cell keeps the lights on, and Android 5.0 is running the show. The decision is yours. You can grab a 32GB carrier branded second generation Moto X and hope that you don't need more storage. 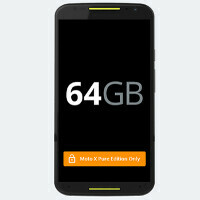 Or, you can go ahead and buy the 64GB Pure Edition directly from Motorola. Unfortunately, there is no subsidy on the latter model. No need for a phone that isn't dependent on carriers for updates, not full of bloatware, and doesn't have features disabled? Sigh. I REALLY REALLY want this but it's almost twice the price I paid for my OnePlus One. And the specs aren't quite as good..... Less RAM and I'm sure the camera isn't as good. True dat! The OPO is a miraculous device for its price. Best decision I have ever made this year. I totally agree....If OnePlus or other OEMs can make quality devices like OPO then Moto Sammy might be in trouble in the coming years. The battery life is not an issue with the Moto X. You have to remember the Moto X is using an AMOLED display which helps conserve battery life (Moto display). Also the Moto X is the only one using a new class of antenna that can save up to 500% more power when using 3G/4G/LTE. Also the Moto X has Lollipop now. Not to mention its voiceless controls and 4 front mounted IR sensors, Moto assist, and other things only found on the Moto X. Not to mention but with 64gb that will do a lot of people. But how much is enough? People are always going to want more. I can get a full day's usage from my 2013 model, though I am sure others aren't so fortunate as they probably power users. I think that the 2300 mAh battery is enough for the Moto X, for those that feel it's too small, Motorola has a solution for you with the Nexus 6 and Droid Turbo. They said the same thing about the Moto 360 when they reviewed it, and subsequent updates dramatically increased the battery life. I don't have a 2014 Moto X so I can't speak in specific terms about it. But considering the X is now on Lollipop which is supposed to save battery those reviews may be outdated. On my Droid Turbo, the Advanced Calling update gave it a big boost in battery life. The problem is none of these sites ever do a follow up review down the road. All devices have issues at launch, it takes a bit to work the bugs out of them. So those initial reviews are only half the story. I still took the 32GB model over the OnePlus One. I am happy with me decision. Perhaps ill give the OnePlus Two a try. A micro sd slot is much more appreciated. Happy with my 32 gig X on T-Mobile. First Motorola phone I've owned, impressed with the build quality, and even more impressed with Lollipop. Remember the Moto X is using a new antenna system that is only found on the moto x which is designed to conserve power by upwards of 500%. Also it uses an AMOLED display which can also help to conserve power. For what it offers compared to the competition I'd say that this is not a good deal. Bought in the same manner, the iPhone 6 64GB costs $749 vs the 64GB Moto X at $599. Mxyzptik can't argue rationally, or use logic to back up his statements. He's just an Apple fanboy that can't stand quality products from the competition. I don't think this is competition. I'm not all that shocked as you don't typically think to begin with. He's just a mad angry ifanboy. He hates anything that's not APPLE RELATED. And he doesn't want any company to beat Apple in mobile sales. Yup I'm just an angry apple fanboy. I wouldn't expect much from someone who compares a phone launch to a not so similar fitness band. You wanna get into that? As I recall you waited for seomone else to take up the argument before scurrying away. But either way, how less salient does that make my point? Don't use some other argument to try and get you out of this one. The price I listed for both devices is the off contract price for the 64GB versions. That's comparing two things equally, maybe that's what confused you. And you don't think this is competition? Two similar devices competing in the same arena? That's what competition is. Unless you're referring to sales numbers. But then many times people will opt for easy and pretty rather than anything that requires them to learn anything to use even though it may have greater benefits in the long run. People could have greater control and get better performance using a manual transmission, but most would rather have something eaiser to run than learn a new skill. No i recall you rambling about something before being put down. You always have to make your point long and drawn out. If you can call that a point. Plain and simple this is not a good deal. Get over it. Funny, you always ask me about what I bring up has to do with this article, yet you do the same when it serves your needs. A touch hypocritical don't you think? And I got put down? Go back and look at that article. My last post was never responded to, because I was in fact right. It doesn't matter if it's two different devices, a crappy launch is a crappy launch. So I will ask again, does that previous argument somehow magically mean I'm wrong here? No, I stated facts. And since you can't argue with that, you redirect as per usual. This is a good deal, unless you somehow figure that paying another $150 for something that has the same capabilities makes sense. And so sorry for drawing out my posts. I do that to make sure my point is plain. Honestly if you can't deal with reading a few paragraphs, I'd hate to think what happens if you were faced with a book. The horror. If you'd like an illustration of why I believe the Bands launch was flawed, here you go. http://www.computerworld.com/article/2852320/microsoft-band-customers-get-scrooged-even-before-holidays-start.html It goes on sale for two weeks, then sales are suspended, then later renewed, and then stopped after selling out in a day or so. They tell customers stock will be replenished for the holiday season, then they backtrack on it. Some customers who got in on the last round of sales found out that their order did not in fact go through. Analysts were saying that they didn't pay enough attention to their inventory. But the worst part is the Band was supposed to showcase the power of Microsoft Health. When trying to get something like this off the ground you need to have all your ducks in a row or you may lose the confidence of potential customers. Really though, the only other two phones on the same platform that have better benchmarks than this phone still happen to be from the same manufacturer. This phone is priced competitively compared to all other flagship devices and it has killer features to boot, better customization than any other phone, and an overall better user experience than you can find on say an Apple or Windows device. So if the 64 GB storage capacity is that important to you then this is a great option. At least the Nexus has dual facing speakers, better battery life, and overall better specs than the overpriced Moto X has . It's just the piss poor inventory management that holds it back since Google and Motorola botched the launch.